It is 8 p.m. on a gorgeous Saturday evening. The big screen is queued up and ready, popcorn is popped and everyone in your family has their special spot for movie night. It is what you all look forward to as a family for the entire week. Just as you are about to click “play” your home begins to shake. The sound begins low and creeps through the night, it appears that the bikers next door have decided to hold an impromptu burnout contest in their driveway. The screaming roar of a 103 cubic inch Harley motor cuts through the beginning of your movie, I mean you can’t even hear the explosions! The cacophony subsides and you restart your movie, just in time to hear the unmistakable bass thump from your other neighbors back yard. You vow right then and there to call Paulsen Insulation about their soundproofing insulation for your basement. The benefits of sound control insulation are many and at Paulsen Insulation, we are proud to carry the materials to make your home incredibly soundproof. Applegate Insulation can quiet your home and leave you with a calm, quiet room that is ideal for that big screen theatre room. Of course it is not only for home theatres but any room in your home that could benefit from a quieter more peaceful vibe. In fact, we have decided to welcome in November with a list, not just any list, but a list of things that you will not hear when you choose Paulsen Insulation for your soundproofing insulation needs. Neighbors: Okay, so maybe this one is a given but no matter how much you love your neighbors, it is far better when you can’t hear them. The yapping Shih Tzu in the backyard at 5 am, the domestic “discussions” at all hours of the night and the screaming children on the swing set. If tall fences make great neighbors, soundproofing insulation from Paulsen Insulation make them virtually disappear. Low Flying Aircraft: We all love a good airshow but if you live anywhere near an airport, you know what we mean. The Boombox Stereo Kid: Every neighborhood has one, the little, obnoxious Honda driven by a kid from the local high school. It sounds like an elephant passing gas when he revs the engine and thundering, bass-heavy music emanating from the open windows. This occurs even in winter and we live in New Jersey. The bottom line is that when you choose to use the soundproofing insulation experts at Paulsen Insulation; you are not only providing your family with a quiet peaceful home, but you will gain efficiency. If sound cannot get in, the heat cannot get out and you will save on your energy bills every month. So give us a call and we will show you just how much soundproofing insulation can enhance your home. 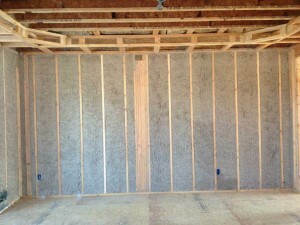 Click Here For Soundproofing Options!